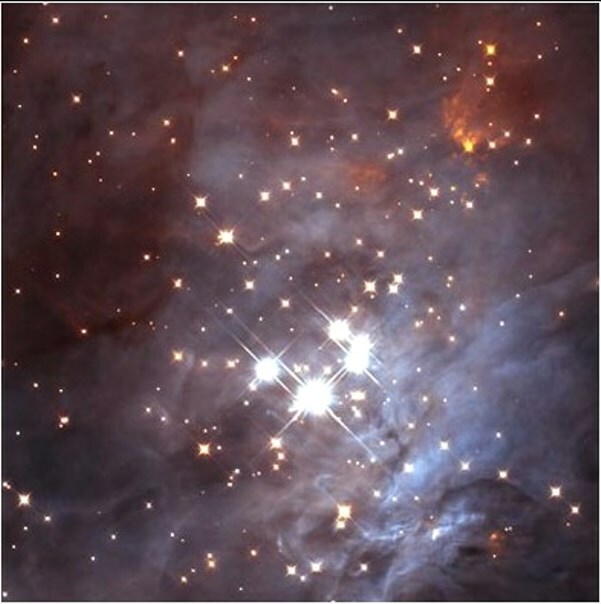 The Trapezium Cluster is a young open star cluster located in the centre of the Orion Nebula (M42). The cluster has an apparent magnitude of 4.0 and lies at a distance of 1,600 light years from Earth. It occupies an area of only 47 arc seconds of apparent sky. Also known as the Orion Trapezium Cluster or Theta-1 Orionis, the Trapezium Cluster can be resolved in 5-inch telescopes, which reveal six of the cluster’s stars in good observing conditions. The cluster is easy to identify because the brightest four stars form an asterism shaped like a trapezoid. 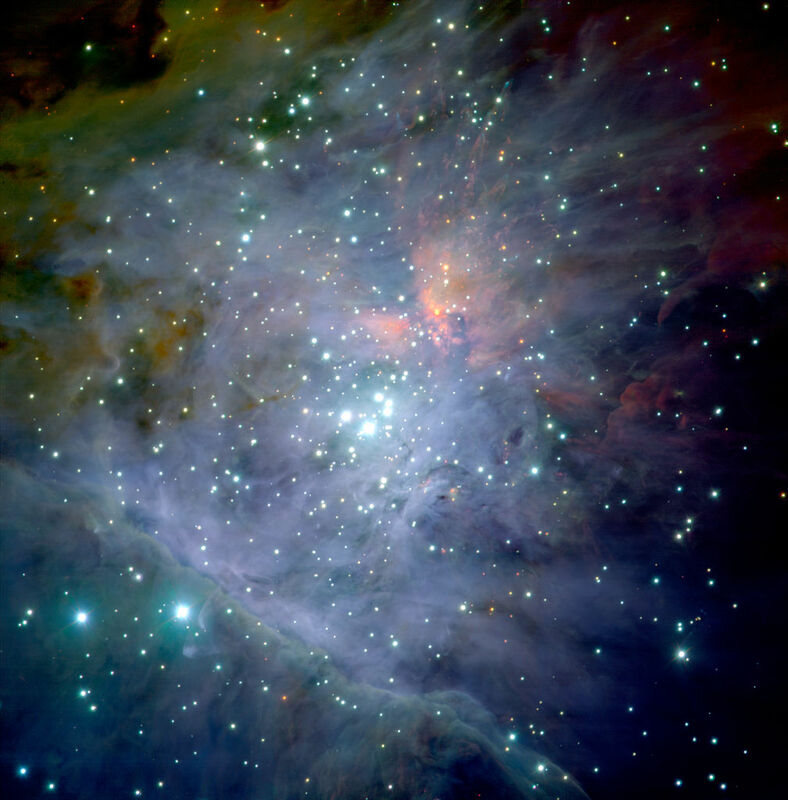 The Trapezium Cluster may be part of the Orion Nebula Cluster, a much larger grouping of about 2,000 stars that occupy an area roughly 20 light years in diameter. The stars of the Trapezium Cluster were formed directly out the surrounding nebula. The five brightest members are found within 1.5 light years of each other. Their estimated masses are between 15 and 30 times solar. The Trapezium Cluster was named for the trapezoidal asterism formed by the massive stars in its central region. The Swiss-American astronomer Robert Julius Trumpler was the first to use the name Trapezium. The young OB stars are luminous X-ray sources and responsible for most of the glow of the surrounding nebula. The four stars that form the trapezium asterism are designated A, B, C, and D. The brightest and most massive of these, Theta-1 Orionis C, has a visual magnitude of 5.13 and the stellar classification O6pe V. With an absolute magnitude of -3.2, the star is 251,000 times more luminous than the Sun and one of the most luminous stars known. In an infrared survey, the star was revealed to be a close binary system exhibiting optical variability. It is one of the nearest O-type stars to the solar system. Components A and B have been identified as Algol-type eclipsing binaries, double stars that orbit and eclipse each other when observed from Earth. Theta-1 Orionis A, also known as V1016 Orionis, varies between magnitudes 6.73 and 7.53 every 65.4325 days, and Theta-1 Orionis B, or BM Orionis, varies between magnitudes 7.95 and 8.52 with a period of 6.4705 days. Component B is the faintest of the four stars that form the Trapezium. The cluster also contains a significant number of brown dwarfs, substellar objects that don’t have enough mass to sustain hydrogen fusion in their cores, and low-mass runaway stars, members moving away from cluster at a relatively high velocity. The Trapezium Cluster may have been the site where the runaway stars Mu Columbae, AE Aurigae and 53 Arietis formed. These stars are moving away from the Orion Nebula at velocities over 100 km/s and are now located in the constellations Columba, Auriga and Aries respectively. AE Aurigae is the star that illuminates the Flaming Star Nebula (IC 405), a well-known emission-reflection nebula in Auriga. In 2012, scientists proposed that the cluster may contain an intermediate mass black hole with more than 100 solar masses. The existence of a black hole would explain the large velocity dispersion of the cluster’s members. About half the stars in the Trapezium Cluster have evaporating circumstellar disks, sites where planets may form in the future. 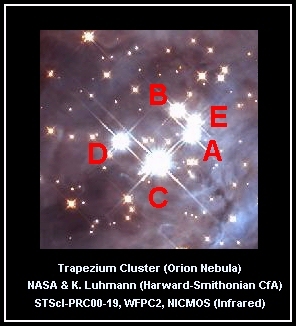 The Trapezium Cluster was discovered by the Italian astronomer and mathematician Galileo Galilei, who sketched three of the cluster’s stars, but did not see the surrounding Orion Nebula. Dutch scientist and mathematician Christiaan Huygens independently discovered the three stars in 1656 and the fourth member, Theta-1 Orionis B, was discovered by the French astronomer Jean Picard in 1673, completing the Trapezium. Huygens himself observed the fourth component in 1684. Several more stars were discovered in 1673 and, by 1888, a total of eight members were known. A few of the stars were later discovered to be binaries. Two views of the Trapezium cluster in the Orion Nebula, from the Hubble Space Telescope.